The number one asset for organizations competing in a global economy is its people. This point is generally shared, but more typically than not the value of human resources is diluted as current affairs, emerging issues, and the woes of the marketplace cloud critical and strategic (deliberate) planning on maintaining and enriching these critical assets. As companies try to save a dollar in this global recession, many are opting to not replace senior staff when they retire, or hire staff with less experience. In some industries, the short-term gain from lower operating expenses may be a net long-term competitive disadvantage. In prior articles, I have pointed out that beginning this year, 10,000 Baby Boomers will turn 65 every day and continue to do so for the next for 20 years; and by 2030, almost one out of every five Americans -- some 72 million people -- will be 65 years or older. The point is simple but alarming for many organizational leaders reaching retirement age: A large portion of senior leadership within government, corporate, and non-government-organizations (NGOs) will be transitioning out of their positions in the next five years. How can these organizations and their existing leadership develop a strategic succession plan, and one that embraces the new generation of leaders needed to address issues of constraint, growth, enterprise risk, innovation, and sustainability? Numbers and statistics can paint many pictures, often causing undue anxiety about the state of the present and fate of the future. Over simplification of certain trends, like the aging workforce is equally dangerous. A lack of care and concern over the impact of organizational change in the wake of retirements could leave many companies ill-equipped to effectively achieve transact their business strategy. In a nutshell, the transition of the older generation out of certain careers and the advancement of the younger generation into their shoes is an enterprise risk which can impact reputation and image, business continuity, and fundamental pillars of business value like quality, performance, price and overall competitiveness. The beating heart of every organization (manufacturing, IT, government services, oil and gas, transportation, etc.) is its people. People innovate and make these complex systems work, providing them purpose and life, enhancing their value and reputation, and working to ensure safety and compliance so that their enterprise continuously earns the right to do business in the eyes of society. Many people I work with are in leadership positions, Vice President's of Environment, Chief Sustainability Officers, CEOs, CFOs, and others. The leaders in these positions, from early-stage innovative companies going to market for the first time, or very mature multi-billion dollar Fortune 500 companies, share a certain amount of concern over succession planning, and what the next five years will bring. Their concern is for their own position, and who will fill their shoes, but also for the entire enterprise, where for some companies, thousands of highly skilled employees that have been with a company for 20 or 30 or more years will be retiring. This issue transcends senior management, mid-level management, and all operational employees of the organization. And, the issue is not just about the loss of technical and highly skilled labor, but also a loss in corporate knowledge, culture, and identity. For those companies that have a heavy base of employees that have been with the business for decades, there may be a greater enterprise risk at hand versus companies that have been nurturing the growth and realignment of their workforce for some time. The risks will be different for every organization but in short they relate to: loss of organizational knowledge; potential disruption in operating controls and procedures; loss of talented and skilled labor; shifts in behaviors and norms that represent the "culture" of the company and in a sense, the internal and external identity that have afforded its reputation; and in worst case scenarios, deterioration of product/service quality and value to customers. As an ever-present enterprise risk, managing the talent of the organization is essential to do as early and frequently as possible, and to minimize or altogether avoid crisis events, and the long-tail of uncertainty and crisis management that can occur. Obtaining concrete data and information on the enterprise vulnerability and resiliency to changes in workforce status is essential to curtail any "crisis event" that could be associated with the loss of any knowledge and practical experience from employees transitioning to retirement. Too often "perceptions" of what is happening in the enterprise rule out analysis grounded in data, facts, and active "sensing" of the employee base. Companies can skirt some challenges working in a world of perceptions; but those perceptions become a hard reality if and when crisis events trigger. During those times, whether it be an industrial accident, natural resource damage, product liability, or financial and governance concern, it is essential to tap the institutional knowledge of experienced staff and executives. The long-tail of crisis management (see figure below) is often best managed by those which have had a great deal of exposure to enterprise risks, stakeholder relations, and crisis management in their career, again supporting the need to have a balance of knowledge, experience, and ingenuity throughout the organization at any given time, and in the right positions. Many of the risks associated with projected exodus of a knowledgeable workforce can be addressed with strategic succession planning for every level and responsibility within the enterprise. Through the use of strategic succession planning and action plans, organizations can dramatically reduce their enterprise risks associated with the retention or loss of their human capital. Further, succession plans can ensure continuity in business operations during times of growth and constraint. No one-size-fits-all approach to strategic succession planning exists. However there are some generalized ground rules and context that organizations can put into their planning effort so that they fully assess their situational needs and requirements regarding human resources, and define what their needs will be, and in the context of their corporate strategic plan and other influencing factors. The figure below summarizes three essential corporate elements to consider when defining succession plans: Governance, Processes and People. Corporate governance policies and procedures help to define and ensure the enterprise is working within the rules that ensure compliance, accountability, and transparency. Senior management has much of the responsibility for governance, however organizations need to continually reinforce governance procedures throughout the enterprise, particularly during times of business transition or vulnerability, and in particular, during times of employee turnover. Corporate processes involving data, metrics, reporting and disclosure, and compliance are also susceptible to disruption during transitional periods. These essential processes need to be made transparent, accessible, and teachable so that the next generation of employee can quickly and effectively work within these processes to ensure business continuity and growth. Finally, strategic succession planning envelops the people side of the enterprise, perhaps the most important asset of all. Without the right people, governance and processes fail to function as intended. People need to be knowledgeable and experienced, but they also should carry values and traits that enable them to be accountable, resourceful and resilient, and empowered to effectively work cross organizationally and with external stakeholders. The nature of business has become more complex. Enterprise risks transcend operational, financial, reporting, legal/ethical, reputational, and stakeholder influences, opportunities and challenges. As such, the skill set for high-functioning employees is shifting. Many hiring managers that I have interviewed for this article tell me that while they continue to seek high-disciplined technical expertise (candidates with strong backgrounds and academic degrees in science, engineering, mathematics, etc. ), they also are looking for individuals that are systems thinkers, strong communicators, and natural collaborators that have tolerance for ambiguity and which have strong values and judgment to work independently and in cross-functional roles. It seems many hiring managers are looking for a strong balance of skills, capabilities, and personal motivation and values in their new strategic hires. In many ways, this comes as no surprise, not just because the internal and external drivers influencing modern business are transforming and in some cases more complex, but also because organizations are constrained by capital and seek multi-faceted talent that can effectively do many jobs. The evolving pursuit of sustainability within organizations also supports the need for active and ongoing strategic succession planning. Sustainability has taken a front-and-center role in defining new markets, products, and competitive differentiation within many corporations. Companies including GE, BMW, Xerox, Green Mountain Coffee, Method Products, FedEx, CSX and Duke Energy have incorporated strategic sustainability planning and market facing innovation and technology into their business. For some companies, their strategy is directly tied to the employee experience and their leadership development. We focus our community engagement and corporate service programs on specific societal issues, including the environment, community economic development, education, health, literacy, language and culture. These are areas of urgent societal needs where we can apply IBM's technology and talent to solve problems, rather than simply making cash donations. We believe that direct action and collaboration, not spare change, are the path to real change. In 2011, IBM celebrated its 100th year in business. In recognition of this achievement and demonstration of its commitment to global service, the company is aiming to have all of its employees, some 400,000, donate a minimum of one day toward community service. IBM has also deliberately tied global service to leadership development programs. Since 2008, the company has operated a "Global Enablement Teams (GET)" initiative, which matches four to five senior IBM executives with local IBM management in developed and developing countries with the goal to advance their strategic focus, leverage corporate knowledge, and develop regional expertise networks. The IBM GET program is one example of several internal initiatives they are using to educate and train the next generation of sustainability leaders, and by leveraging the existing capabilities, know-how, and knowledge of their senior executives. The reasons corporations seek out these leadership traits in new talent in sustainability and other corporate functions is deliberate and grounded in competitive differentiation and advantage. Strategic succession planning is about finding, acquiring, training, and supporting the right people for the right positions during the right times in the evolution of the organization. 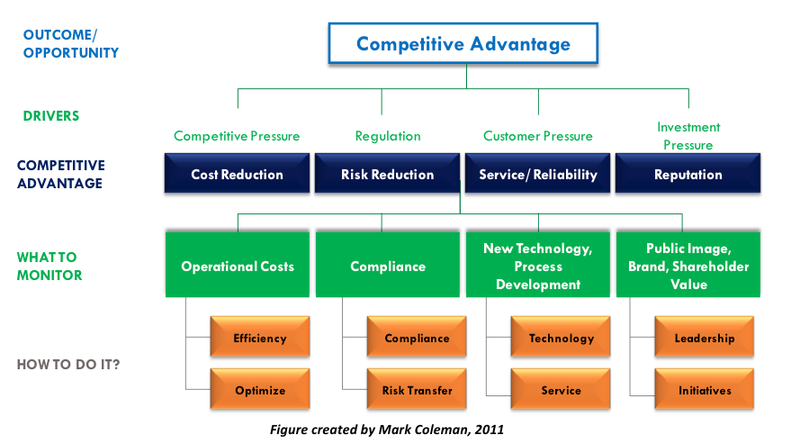 The figure below summarizes, from a "strategic sustainability" viewpoint, how competitive advantage can be achieved. While governance controls and the best processes can create and define the steps for achieving differentiated business strategy, people are the means by which competitive advantage is truly achieved or not. Thus, integrating succession planning, within the current and projected operating environment for the company should be tied to strategic business planning to balance the minimization of any adverse impacts from enterprise risks tied to people while maximizing the potential for competitive differentiation. Enterprise risks are often thought of external factors impacting the current and future state of the business. But, enterprise risks are also internal, and can be tied to the "perceptions" people have about their span-of-control and influence within the business. For example, in the first third-to-half of the past three decades corporate environment, health, and safety (EHS) professionals did a monumental job demonstrating their value, role, and purpose to senior management. Originally criticized as a cost-center, EHS has now evolved to a high functioning center of service and in some cases, technology excellence that support all elements of the business: product developers, supply chain, business units, customers, finance and reporting, etc. In the past decade sustainability has taken precedence for many corporations. The skill set, training, and experience for Chief Sustainability Officers is much different from that of those in "more traditional" corporate EHS roles. However, many EHS professionals feel their value to the company has been proven, tested, and validated -- and that their role maps directly to sustainability. This perception is somewhat true. Their value may have been demonstrated, but there may be a gap in how senior management views the traditional role of EHS compared to the more dynamic nature of sustainability on the company. Thus, corporate EHS professionals that feel they have a distinct advantage to envelop corporate sustainability have to, as they did in the past three decades, demonstrate once again to senior management why they are the in-house organization to lead this newer corporate charge. There are systematic processes and options for EHS, or other corporate organizations (HR, Legal, CIO, etc.) to determine whether they have the right mix of talent in place to address current and future organization human resource needs. 1. Assess Organizational Needs. This requires alignment with the strategic business plan and strong consideration of external drivers on the business including: risk factors, shifts in the global regulatory environment, volatility in commodity markets and supply chain, trends in transparency and reporting, and greater requirements for stakeholder engagement and achievement of voluntary standards or customer requirements. 2. Identify Talent Gaps. Requires a review of existing position responsibilities, titles, scope of influence, pay and benefits in the context of talent development and management. As the enterprise transitions through the economic recession, internal staff can be developed so that the enterprise has the right balance of critical and leadership skills to position sustained long-term growth. 3. Partner for Long Term Talent Development. A number of organizations can aid the enterprise in managing and developing its talent pool including trade associations, professional development organizations, colleges and universities, peer-to-peer knowledge and leadership networks, among others. Partnering, for example, with universities to design and develop customized training and education modules to serve your enterprise growth needs can be a strategic way to help ensure retention and development of top talent. 4. Develop and Take Action on the Strategic Succession Plan. Establishing a strategic plan requires organizational buy-in and commitment at all levels of management. Taking action requires accountability and follow-through. 5. Evaluate, Forecast, & Refine. Succession planning and talent management require ongoing review and resolve. The marketplace, stakeholder needs, role of technology, regulatory environment, and pursuit and execution of innovation are never static; these business influences are always changing and evolving with society. By evaluating, forecasting, and refining succession planning in context with existing and expected enterprise risks can keep organizational human resources efficient, effective, and timely. There is a convergence occurring between science, technology, policy, and market opportunity that is pushing a more efficient utilization of financial and natural resources throughout industry and government. As this convergence evolves, the external influences on corporations intensify. In parallel, internal capacity to grow and manage these influences in-step with their development is a business priority. A major society shift is underway and quietly leaking knowledge, experience, and reputational value from industry. Mass retirements pose an enterprise risk, and an opportunity, for corporations to ensure they have the right talent to deliver on the strategy of the corporation today, and competitively differentiate the company into the future. The timing of this sea-change comes at a vulnerable, yet critical time. Globalization, economic pressures, the uncertainty around carbon and natural resource availability, and global development concerns all circle the future disposition, strategy and requirements of the modern corporation. Businesses are made efficient by technology and processes, compliant through policy and controls, and competitive through market relevant and value-added products and services. Front-and-center in this business context is the need to have the right people in the right positions at the right time.